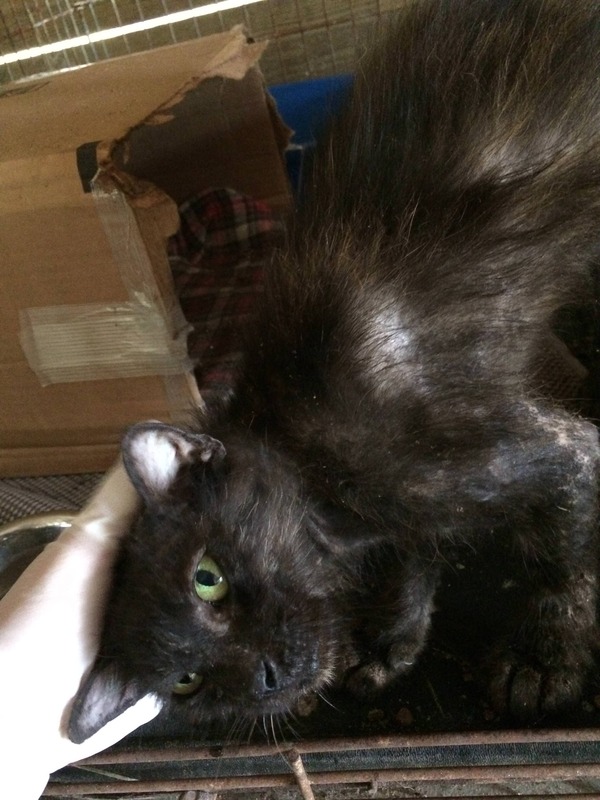 We were asked to help a stray kitty in horrible shape. Someone hid her away from an angry neighbor that wanted to kill the kitty. So, we took her in because we need a barn cat and she needs help. 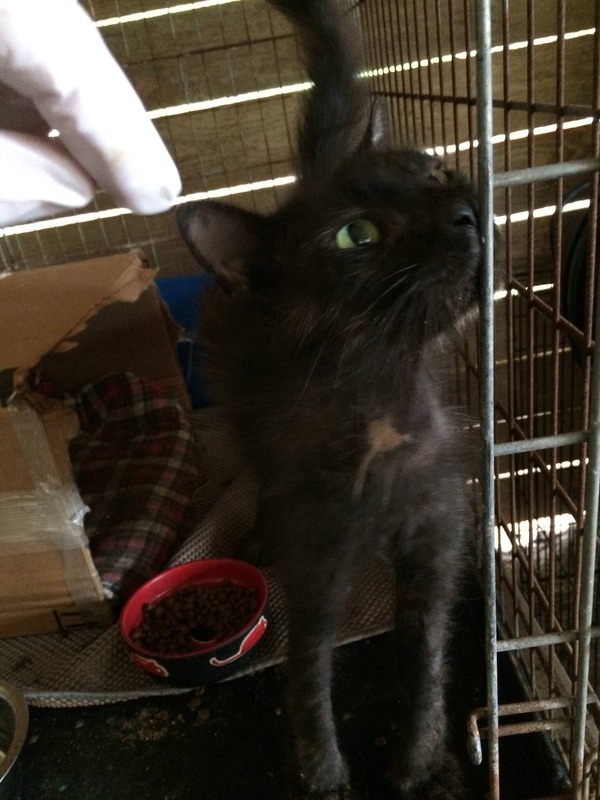 Her rescuer scheduled her for Friday with the low cost clinic, but our vet waived the urgent fee and worked her in today. Delilah has scabies and hookworms. 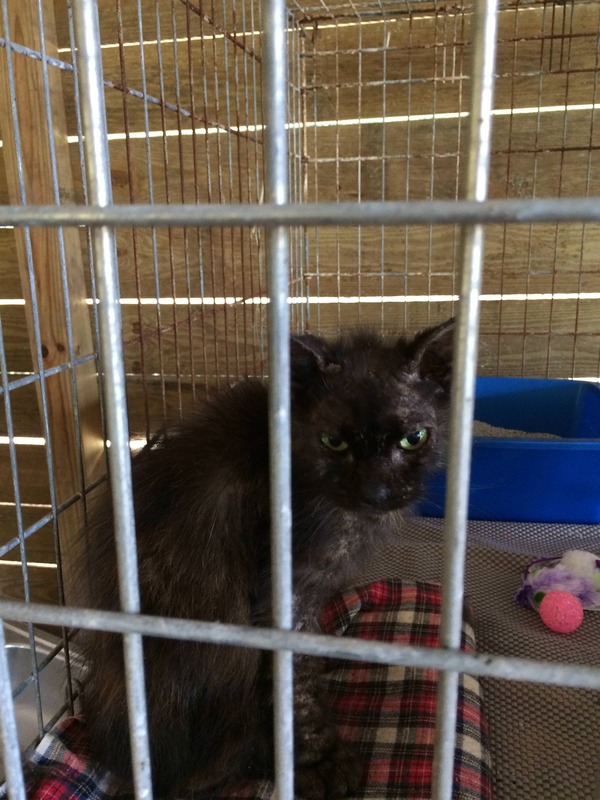 She is in a crate in the horse barn for three weeks to keep her isolated and get her used to her new home. She has a recheck in two weeks. She is terribly itchy and wants to snuggle. She has very swollen feet and layers of thickened skin all over her body. She is so skinny that the vet could easily feel her kidneys. I have never felt a cat this skinny. Ever bone and depression between her bones is easy to feel. Her chest is sunken in. The good news is that she is only two years old and spayed (YAY!) so she should recover nicely. She was purring and gentle at the vet's. I think her green eyes are very pretty. If anyone is interested, I can post pictures as she recovers. She gets her vaccines at the recheck, when she is stronger. I'd love to see her progress. She does have beautiful colored eyes. In a week would it help to give her a bath with a oatmeal mix to sooth the skin & clean up a bit? Poor little girl. Hope she heals fast. She must be miserable. Thank you for taking care of her. She looks a whole lot like my kitty when she showed up. She was that skinny too but thankfully, didn't have the skin problems. But it took her digestive system a good six months to recover. I'm glad she found you. poor baby,Glad she got some one to help her out of that mess. Poor little mess. Those feet look like they hurt. Poor girl - so glad you have her to help her heal. Yes, please share photos of her progress! Thanks, guys. Yes, I asked about bathing her. RRW, the vet suggested a very gentle shampoo because everything is so raw. I have a puppy tear free one she thought would work. I'm sure the oatmeal shampoo will help a lot down the road. Great suggestion. Jubal, we like Taste of the Wild. It has to be dry food because she is outside, but I was thinking about adding a vitamin supplement after her second deworming. Do they sell kitty probiotics? They are true carnivores, so maybe amino acid supplement instead? Maybe Heidi knows. Heidi would know about feeding a starved cat. She helped me with Grace. There are cat probiotics. I found a Purina dry food called Gentle. She has done really well on it. Here's the thread when my kitty first showed up in my barn and everybody, especially Heidi, helped me with her. Jubal, thanks for the link. I wish I could feed wet food, but the fire ants.... She is fed in a crate and the crate is on top of a table. So far, the evil ants haven't found their way into her dish. I don't dare try wet food with her confined. She drinks a lot and eats as soon as I put the food in front of her. I give her more than she can eat at one sitting so she won't run out. I might need a bigger water dish. Delilah had solid poops yesterday. The dewormer must be working. Hookworms are no joke. I am very glad she went straight to the crate when we got her. She is highly contagious for three weeks. I use gloves to pet her and clean her poop. Hookworms can live in the soil where the cat poops and go through the skin of someone walking barefoot. Even a freeze won't kill them off. They can live in soil for years. I told the lady from the apartment about not walking barefoot where the kitty used to hang out (and making sure she lets parents/kids know). I told her she should tell that evil, cat hating, neighbor that walking barefoot is better for you. She laughed. You could just put small amounts of wet food in, and wait a bit, then take up the dish and leave her with the hard food.Most cats will clean up a serving pretty quickly. Can you set the table in a kiddie pool with water in it? Would that deter the fire ants? Little bast---- just make flotillas. No bath until three weeks is up. Vet wants her in isolation. I just got back from being out-of-state since Sunday. Was cleaning up Emails and saw a PM from LC and came to check out this topic right away. 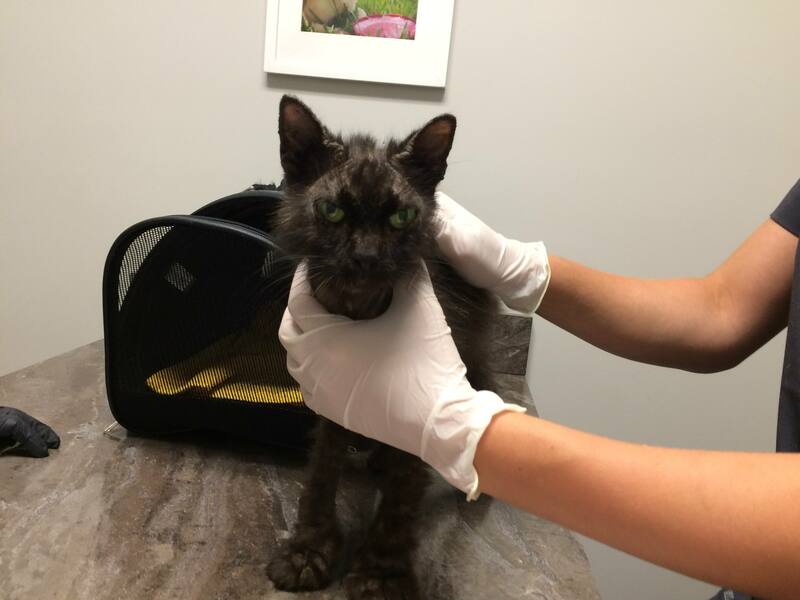 The first step in the treatment of mange is isolating your cat to prevent the condition from affecting other pets and humans. Your vet will prescribe medication to kill the mites. 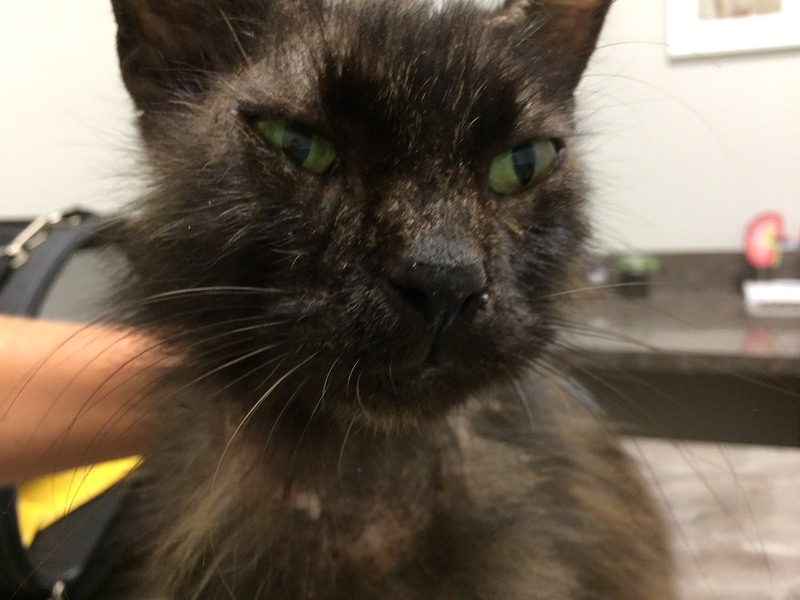 Depending on the type of mange and your cat, medication may be applied topically, by injection, or by shampoo and dip. You vet may also prescribe an antibacterial shampoo or anti-inflammatories and antibiotics to treat skin issues and ease inflammation. Although mites are quickly killed, results are usually seen after a month of treatment. It looks like treatment, good food and love will help her recover. I would love to watch her progress. Thanks, Heidi! She gets Ivermectrin once a week for three weeks. She had her first dose Tuesday. Recheck is on the 28th. If she is clean, she gets bathed and out of the crate. The hookworms will be treated again during that visit. We have asked our friend to help us build the tack room in our barn. I intend to put in a door with a cat door that can be shut at night to keep her safe. Miss Delilah can move into there when she gets out of the crate. A door in the tack room sounds wonderful! 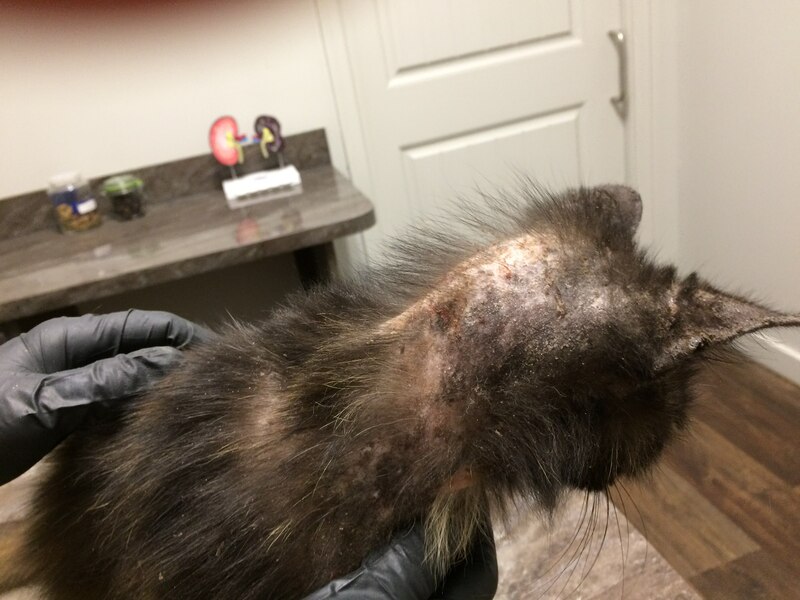 The ivermectin should kill the mites and all we (you and she) gotta do is wait for the itchy scabs to heal and the inflammation to go down so her fur can regrow. I'm sure she feels miserable, but with you helping her, she will feel better soon. 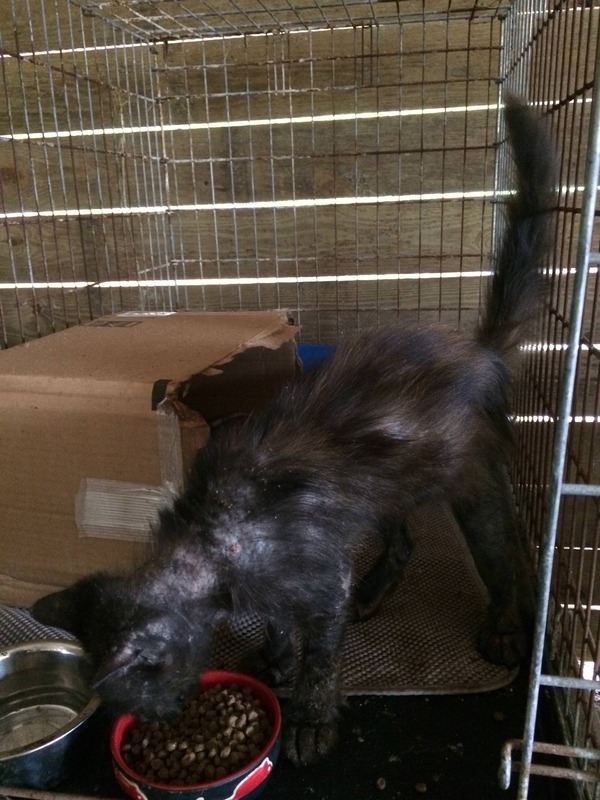 She's probably so happy to find a home and regular feeding, she doesn't even notice the itch. She does seem to be itching less. When I pet her back, the bones aren't quite as prominent. The space between the spine and the ribs has filled in a little. She is definitely gaining weight. She eats a lot, but her bowl still has food when I check her at least twice per day. Every time I'm in the barn, I talk to her and call out her name. She answers in her raspy little meow. She has two water bowls to make she has enough. She loves her snuggly bed I made in a small cardboard box. She purrs as soon as she sees us come into the barn. Her toys were moved today. All good signs. One of the neatest moments was when I took her to the vet that first day. I placed her on the table and rubbed her poor body with gloved hands. She looked into my eyes, with her intense green ones, and just purred. She held my gaze for quite awhile. It was like she knew that I was her new human. I think she knew you had saved her. IME working with the ferals and the desperately ill kitties .... they KNOW. They really do. She knows you've changed her life for the better. I can see she looks better. Her coat is already looking way better. 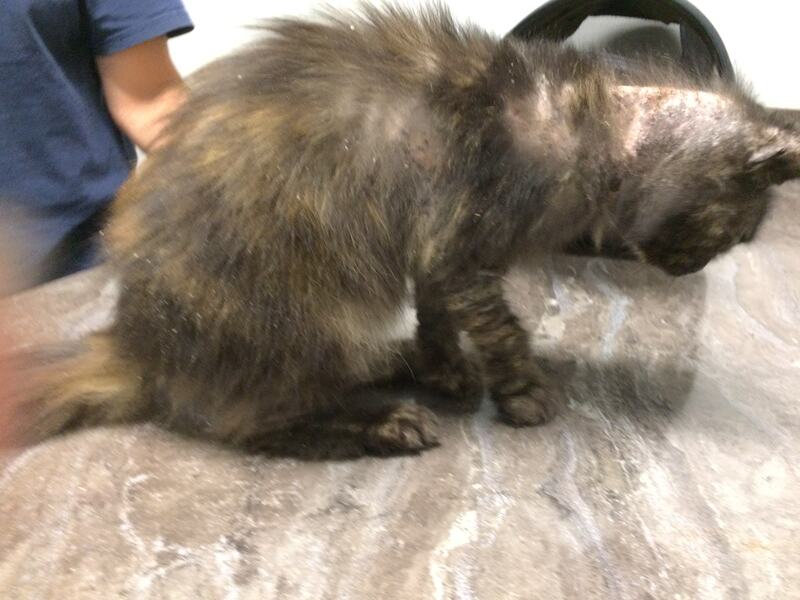 The crustiness is gone from her ears and some hair is growing back on her ears, neck, and back. Amazingly resilient little creatures. Thanks for the photos - so nice to see and hear she is doing better! Aw! She looks so happy, friendly and SWEET! It'll be interesting to see what her full coat looks like. I'm sure she'll pay you back by catching many mice meals. Same is true of men, PD.